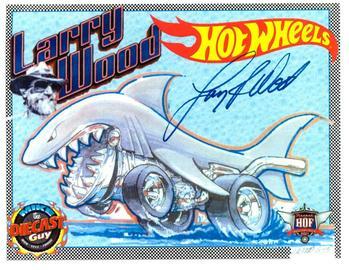 Collectors Convention Designer Autograph Sheet of the Shark Bite by Larry Wood. Presented by Mike the Diecast Guy at the 2011 Hall of Fame event, which hold numerous autograph sessions throughout the event. Hot Wheels and Mattel designers and guests are invited to spend time with the collectors and provide signed prints of their individual vehicle designs or graphics designs. These autograph sessions are a big hit amongst collectors with many standing in line for up to two hours at a time to have the opportunity to talk to the designers and have them sign various different items.